"Lady Catelyn, you are wrong." Brienne regarded her with eyes as blue as her armor. "Winter will never come for the likes of us. Should we die in battle, they will surely sing of us, and it's always summer in the songs. In the songs all knights are gallant, all maids are beautiful, and the sun is always shining." 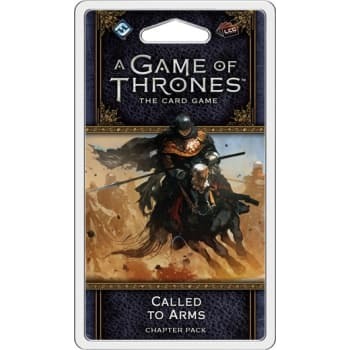 The Called to Arms Chapter Pack is the second Chapter Pack in the War of Five Kings cycle for A Game of Thrones: The Card Game. A new King version of Balon Greyjoy challenges all enemies of the Iron Isles, even as two new attachments give you ways to crown your other characters and make them Kings. You'll also find iconic characters like Dolorous Edd and Shae entering the game for the first time, even as other cards lend new importance to loyal cards. Finally, this pack continues to introduce a focus on the seasons of Westeros with two new agendas!